Quality of Care (QoC) has remained a challenge in most large-scale health interventions, globally. 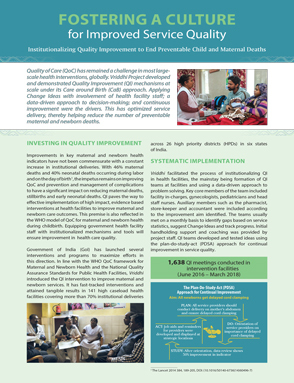 Vriddhi Project developed and demonstrated Quality Improvement (QI) mechanisms at scale under its Care around Birth (CaB) approach. Applying Change Ideas with involvement of health facility staff, a data-driven approach to decision-making; and continuous improvement were the drivers. This has optimized service delivery, thereby helping reduce the number of preventable maternal and newborn deaths.